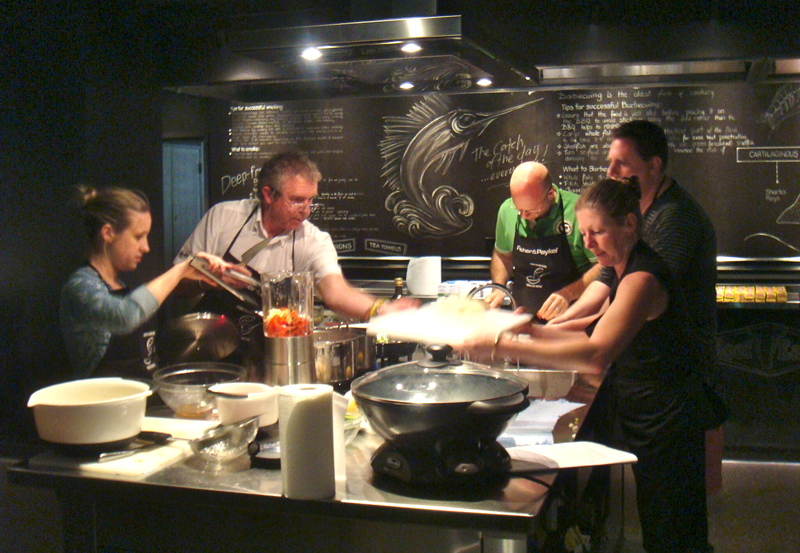 Have you ever looked at the classes at Sydney Seafood School? Seriously, I want to do them all, but the bank says I need to space them out. 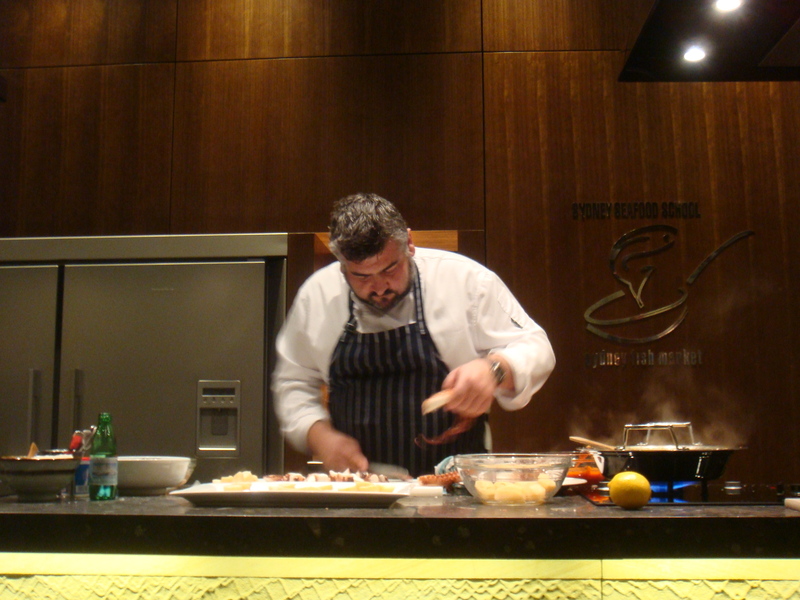 The very second I saw Frank Camorra was doing a class though, I booked. I didn’t even bother to see if anyone wanted to come with me, or ask the bank, I was going. 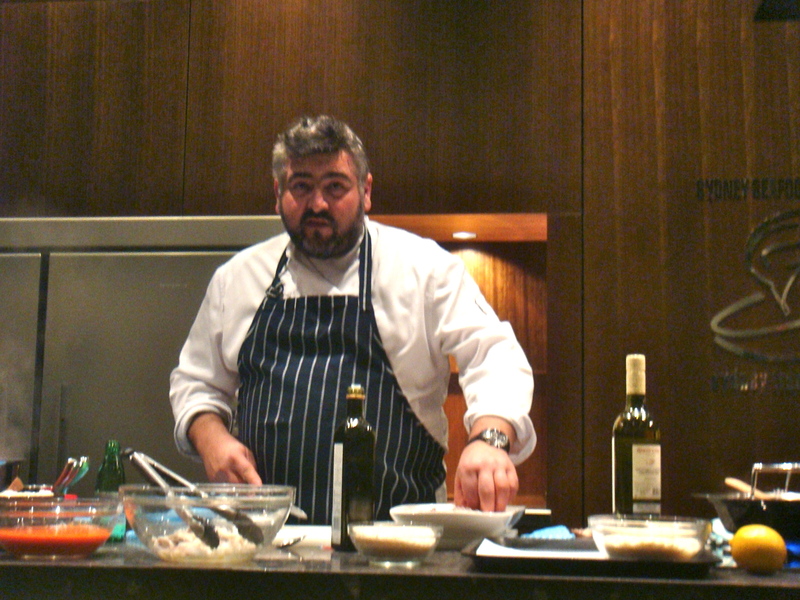 Frank Camorra is a Spanish born, Australian raised legend. You may start to screw your nose up but to me, he is a legend. 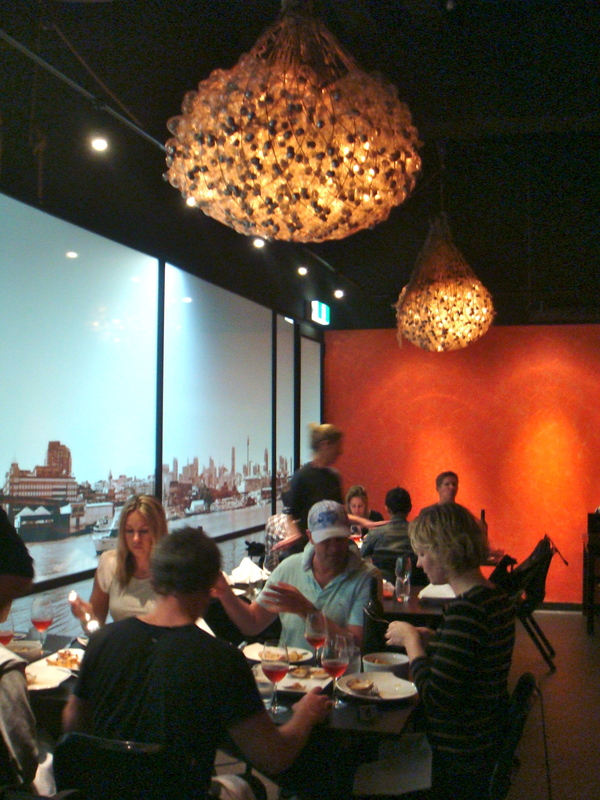 My first visit to Movida this year had me swooning over the place. He just gets it so right. I was first to arrive to the class, maybe 15-20 minutes early, I wanted to get a good seat you see. The doors to the school don’t open until 10 minutes before the class, so I wandered the halls of the downstairs fishmarket. When the doors finally opened I was, of course, first through with a seat in the front row waiting. The classroom feels small and intimate. All the seats are tiered so no one really misses out on anything. Large screens giving a birds eye view of the demonstration bench also are key to spotting anything Frank does. Class notes and a copy of the recipes demonstrated were on each seat for us. Frank looked a bit nervous but actually he came across as a very humble and gentle giant. For his first time at Sydney Seafood School he held the class in his hands. After he demonstrated a few dishes with the help of the school staff, it was up to us to get into the kitchen and have a go at recreating them. Frank had chosen dishes that, I think, any average cook could manage. The kitchen area is impressive. The work stations are designed with one oven and one induction cooktop. Today each station had 4-5 people working at each so we had some juggling to do to get all the dishes made with only a few hot plates. We had four dishes, that we divided between us, to do. I didn’t get the hang of the induction tops at all, luckily the staff were constantly on hand to help us out. Frank also circulated amongst the workstations, willing to help out, answer any questions, or just have a chat. Our table of girls got him talking and he certainly wasn’t keeping any secrets. Frank is looking for a location to open a MoVida in Sydney!!! The day before he had spent the day investigating locations around Sydney. He even asked our opinion. Heading four restaurants in Melbourne already he thought it was time to come north. Come Frank!!! We are waiting! OK now back to the task at hand. The dishes were easy and quick to prepare. 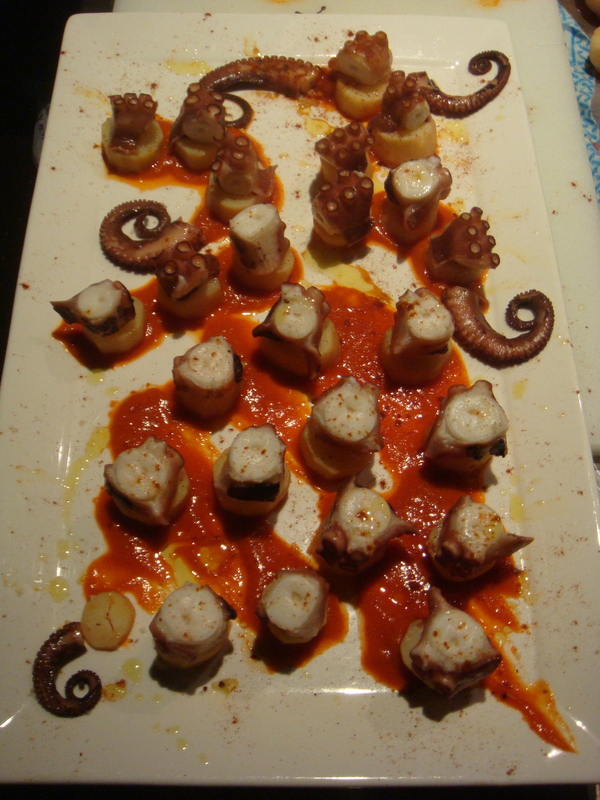 All the ingredients had been prepared and measured by the staff which made it even quicker. 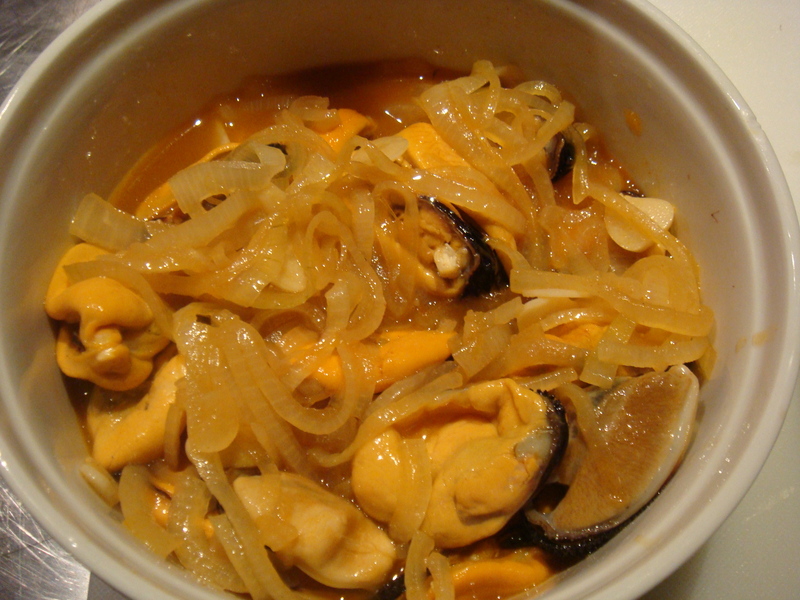 I chose the mussels escabeche to make. I love the intense vinegar flavour of a escabeche. After we had danced around each other, whipping up Franks dishes, we carried then into the dining room. Each work station had its own allocated table. It is an impressive space for a cooking school. 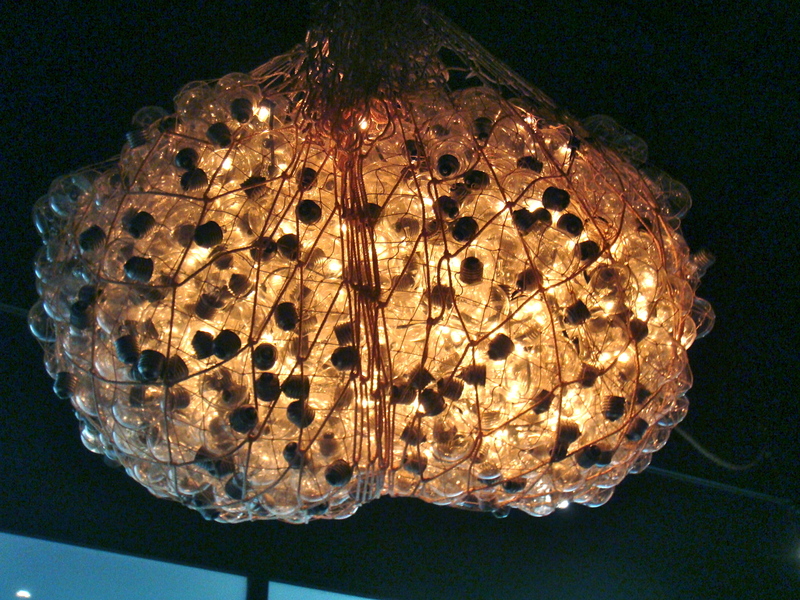 The lighting was intriguing and quite fitting, as old fishing nets filled with light bulbs. Wine was provided with our meal along with takeaway containers for the inevitable left overs. 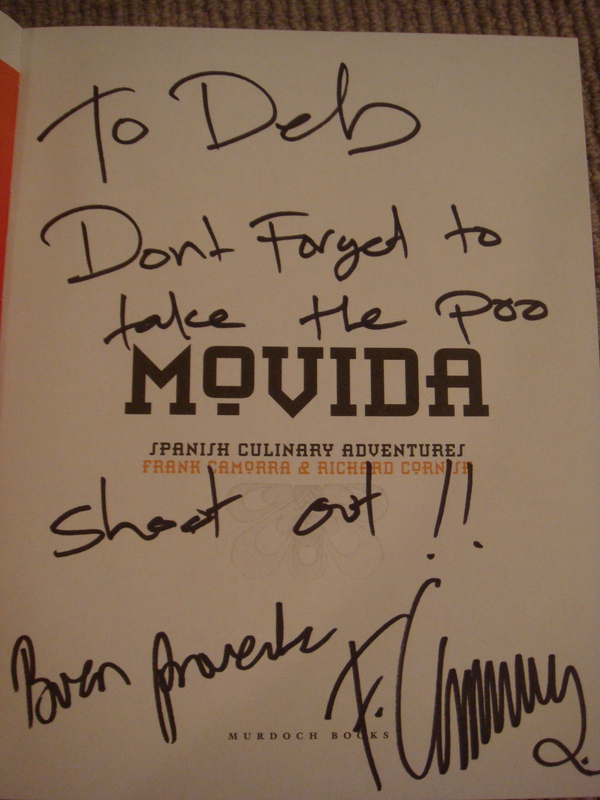 MoVida cookbooks were also for sale. I had Rustica but, of course, now I wanted the original MoVida too. 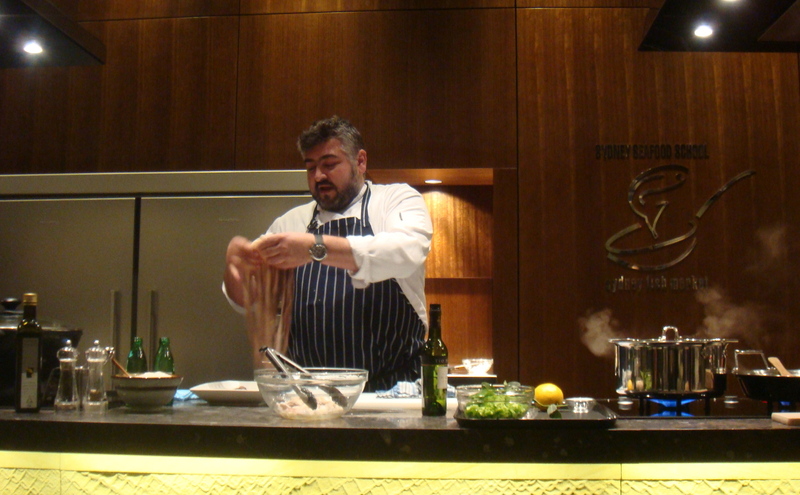 During Frank’s demonstration he had been asked to show us how to devein a prawn, referring to it as the poo shoot. It gave me such a chuckle I had to have it as a momento. I knew about the reputation of MoVida. I even have Frank Camorras’ cookbook, MoVida Rustica but when I managed to grab a last minute table there I never imagined I would love it quite so much. It was my last day for a Melbournian lunch. 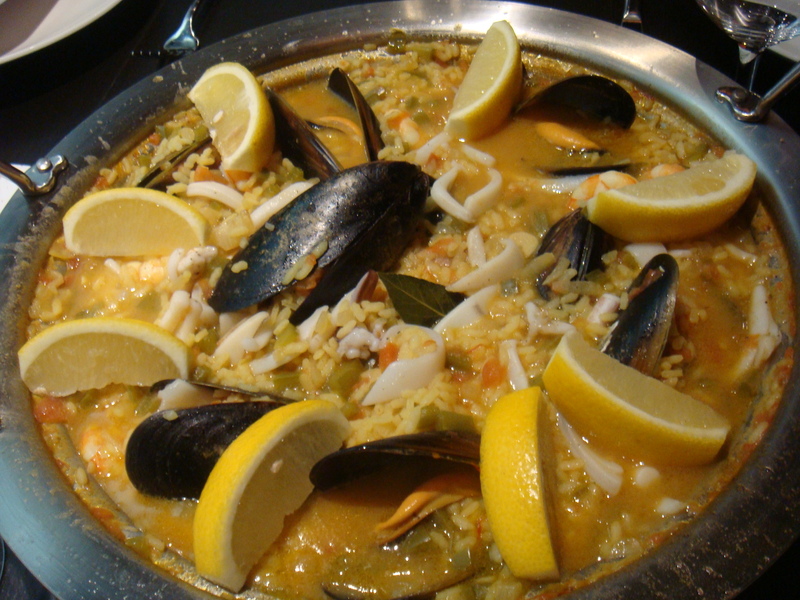 I had a few places on my list to try but MoVida was the first. At 1pm the place was packed. Did I want to come back in 45minutes, you bet ya. As soon as I walked into the place it exuded an unpretentious cool atmosphere. 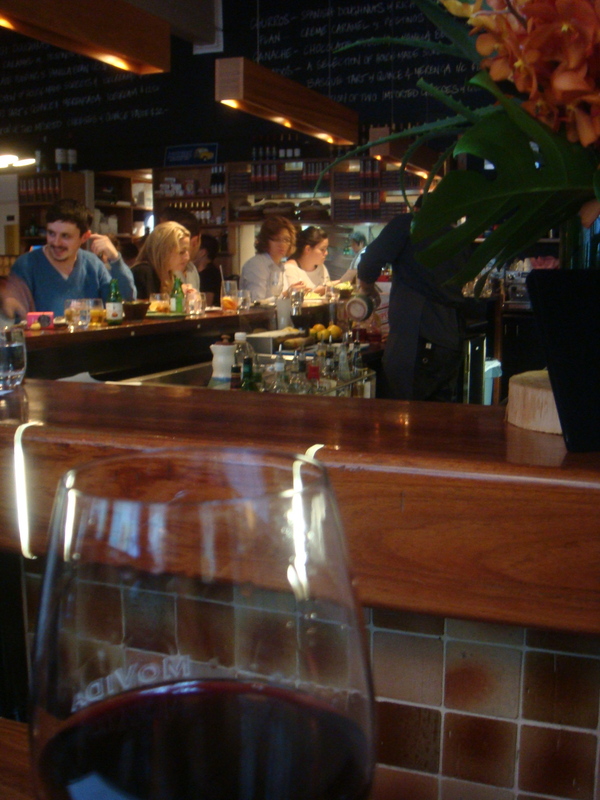 Dim lighting, a long timber bar, relaxed music and people looking like they are having a good time. I was back bang on 45mins. I couldn’t go past trying the hand filleted Cantabrian artisan anchovies on croutons with smoked tomato sorbet ($4.50 each). 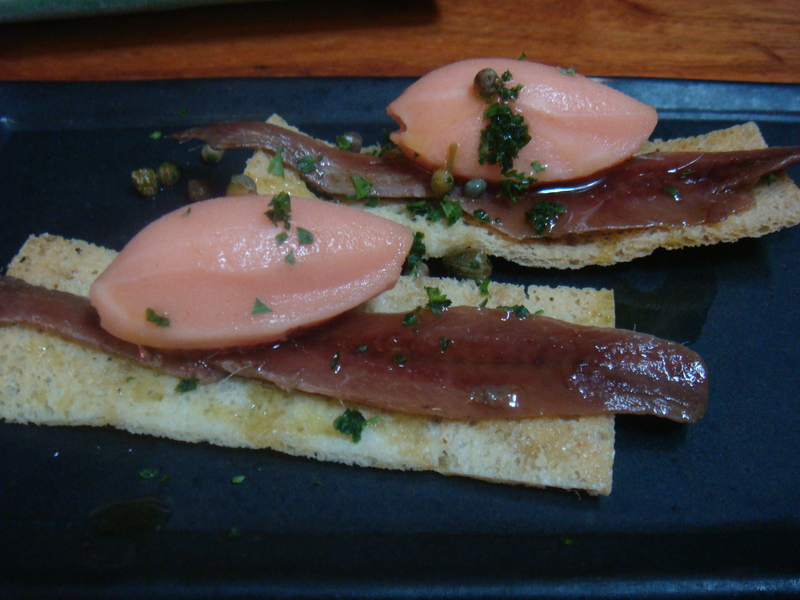 The crispy toast and anchovy were warm enough to take the cold sorbet. I really did imagine myself on a hot Spanish day sitting in a outside a tapas bar. As I waited for my next tapas to come out from the kitchen, which is open to the dining room via a large window, I sipped on a 2009 Paco and Lola Albarino ($13). Next to come out was a special of the day sea urchin and goats curd crostini. 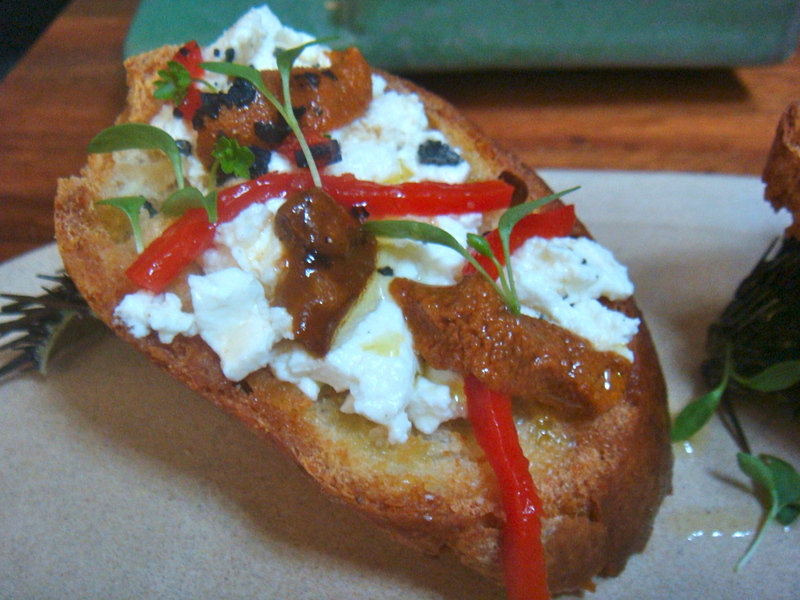 The crostini was warm, providing gentle heat to the curd and sea urchin. It’s a small touch that makes so much difference to the taste of a dish. 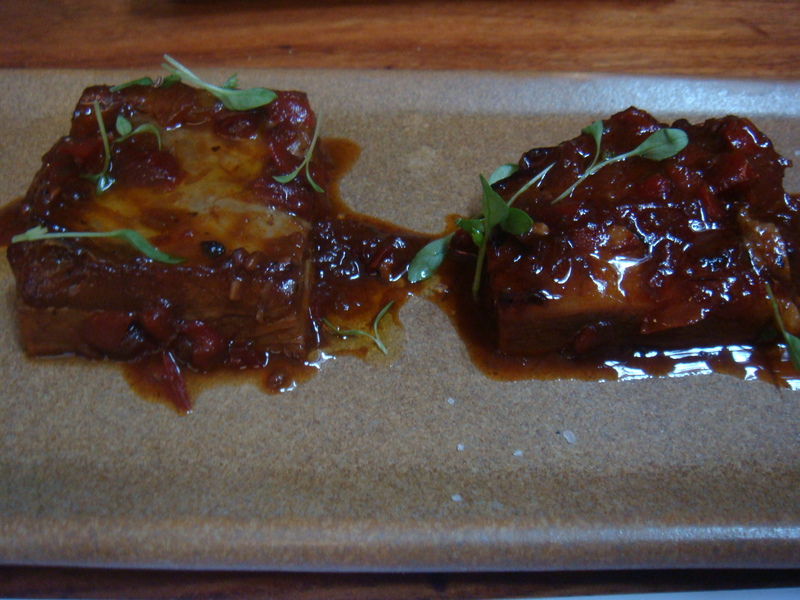 Two beautiful pieces of Pyrenees wet roast lamb with fino and paprika sauce ($4.50 each). They fell apart at the touch and I felt like I was melting into my chair and never wanting to leave. By this time I had stepped up to a 2008 DJP Petalos Mencia ($17). 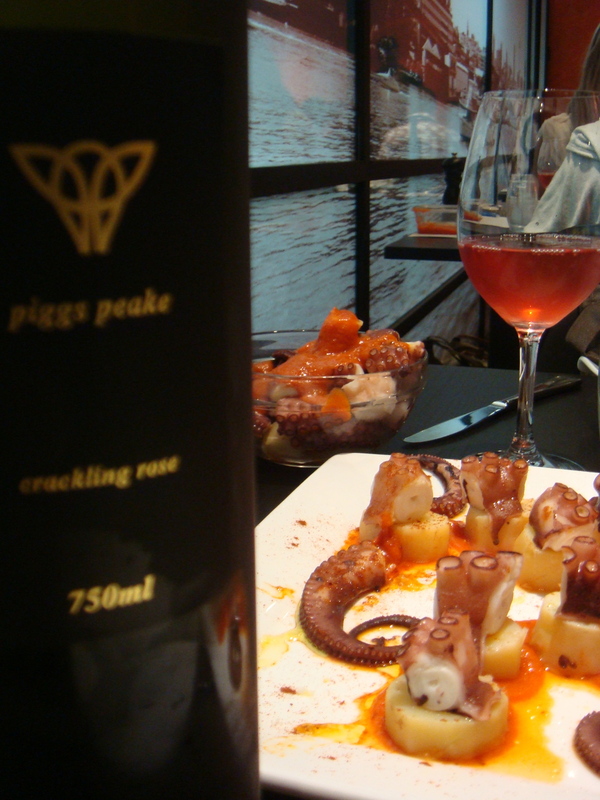 A Spanish wine elegant enough to glide me through the rest of my meal. I was starting to become full but I was determined to eat more. It was just that good. 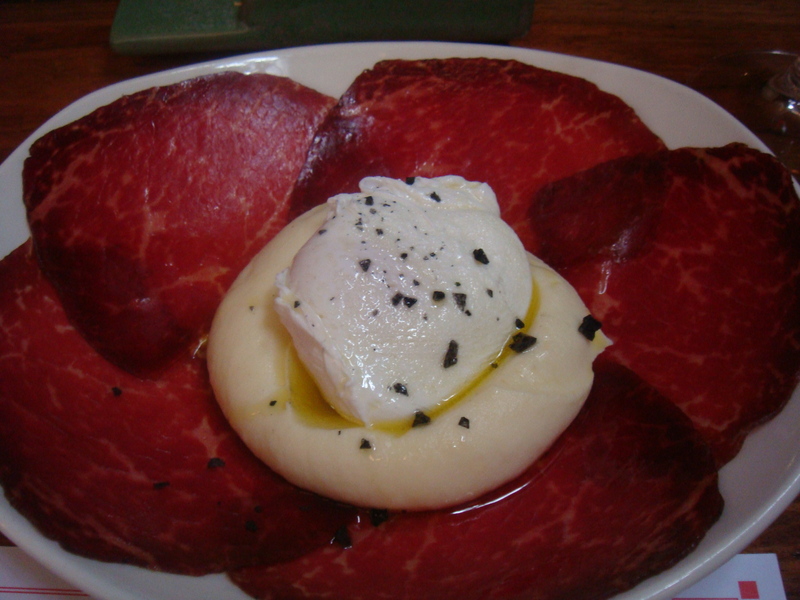 It was suggested by the waitress I try the Cecina, an award winning dish of air-dried wagu beef with poached egg and truffle foam ($19.50). 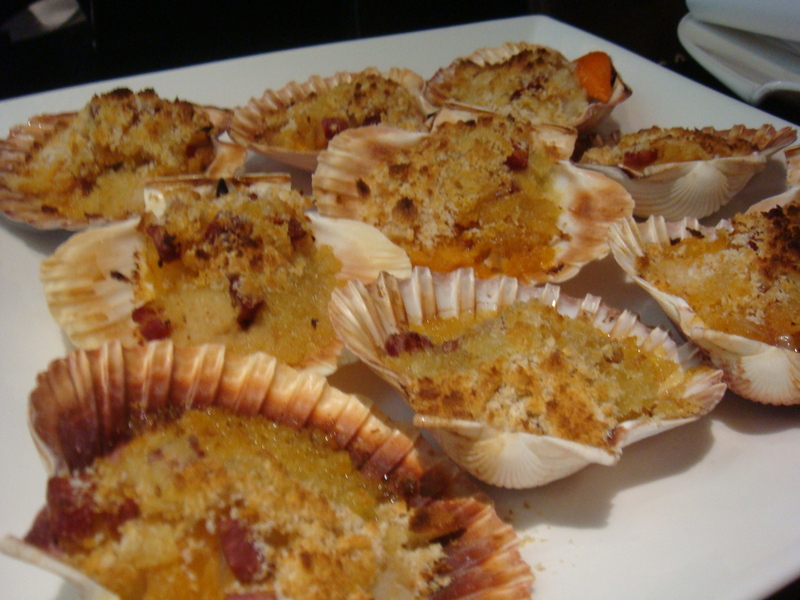 The advice was to mix the ingredients together let them sit together for a few moments to let the flavours mingle and then indulge. It was like the best ever brunch dish you could come up with. The runny egg with soft potato, strong beef with a hit of black truffle. I thought a full dessert would really do me in so I asked for the selection of cheese ($22). 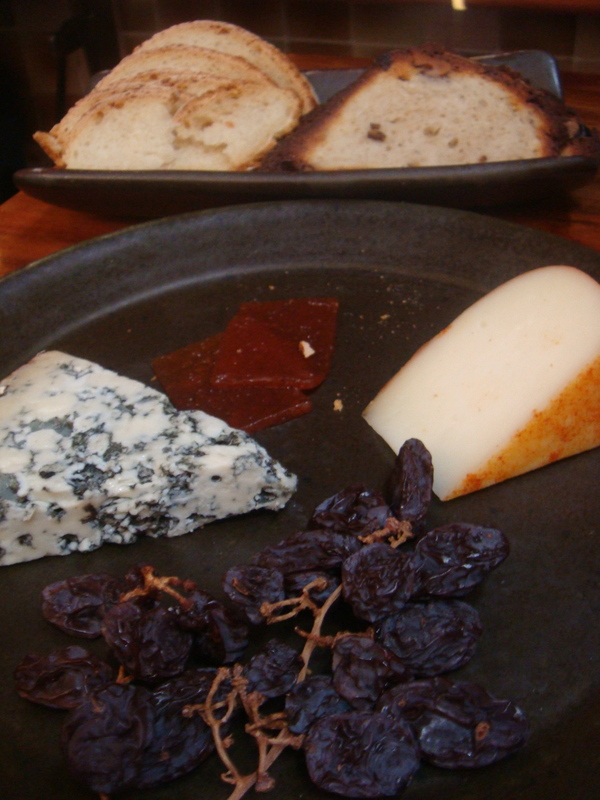 They were two Spanish cheeses, a firm Bica and the blue, a Valdeon, both very fine cheeses. Bica means ‘bag of cheese’ and is a buttery mix of goat, cow and sheeps milk. The Valdeon is a smooth creamy well rounded earthy blue cheese. I had a taste of each and hit the wall. Lucky for me the waiter pinched some foil from the kitchen so I could stash the cheese in my bag to enjoy later. I LOVE MOVIDA. I’m just thankful it’s in Melbourne otherwise I would have a permanent seat at the bar.